The Latin word pyxis means ‘small box’. Boxes like this have been used since the Middle Ages to hold the holy Eucharist (the bread blessed by the priest during Mass). 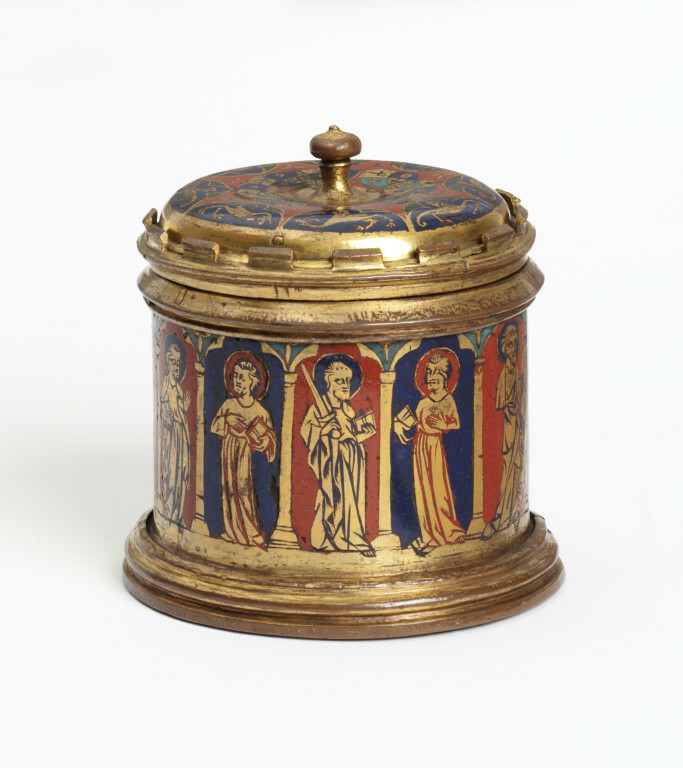 A large proportion of surviving medieval pyxes are decorated in enamel. The enamel work upon this pyx is executed in the champlevé technique of the famous Limoges enamellers, who were influential in the Middle Ages. However the style of the figures and the architecture have closer similarities with Parisian translucent enamels of the 14th century. It has been suggested that this object could be an example of Limoges-type enamel made in Paris. Cylindrical pyx. Copper gilt with champlevé enamel. On the outside, the 12 Apostles beneath canopies upon alternate blue and red grounds, on the inside a man's head and grotesque monsters. From the Soltifkoff and Morland collections. Historical significance: The origins of this pyx has puzzled scholars. The work is executed in the champlevé technique of the famous Limoges enamellers, who were influential in the Middle Ages. However the style of the figures and the architecture have closer similarities with Parisian translucent enamels of the 14th century. Some scholars have suggested that this object could be an example of Limoges-style enamel made in Paris. 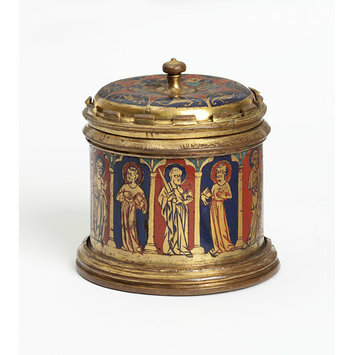 Comparisons in style have been made between this pyx and the goldsmith work of the reliquary of Jeanne D'Evreux, 1339, believed to be made in Paris. The decoration upon the lid may be a coat of arms. The Latin word pyxis means ‘small box’. Objects like this example have been used since the Middle Ages to hold the Eucharist. The Eucharist is the bread transformed into the Body of Christ during the Christian Mass. Wafers of bread were handed out to the congregation and left over pieces were stored in pyxes- decorative boxes suitably precious to hold such important items. Pyxes could also be used by priests to transport the blessed bread to the sick. A large proportion of surviving medieval pyxes are decorated in enamel. This may have been partly due to the relatively inexpensive nature of the raw materials compared to gold and silver, however the popularity of enamel was also due to its ability to colour metal which enabled a wide variety of iconographic designs. Molinier, Émile. L'orfèvrerie religieuse et civile du Ve à la fin du XVe siècle. Paris: Levy, 1902. Labarte, Jules. Histoire des arts industriels au moyen-âge et à l'époque de la renaissance. Album.. 2 vols. Paris: 1864. Falke, Otto von and Heinrich Frauberger. Deutsche Schmelzarbeiten des Mittelalters, und andere Kunstwerke der Kunst-Historischen Ausstellung zu Düsseldorf. Frankfurt am Main: J. Baer, 1904. Objets d'art et de haute curiosité composant la célèbre collection du Prince Soltykoff. Catalogue of the auction held at the Hôtel Drouot, Paris, April 8 - May 1 1861. Objects of art & vertu. Auction held at Christie's, London, May 8 - 12, 1866. Robinson, J. C., ed. Catalogue of the Special Exhibition of Works of Art of the Mediaeval, Renaissance, and More Recent Periods on Loan at the South Kensington Museum, June 1862. 2nd edn (revised). London: George E. Eyre and William Spottiswoode, 1863.